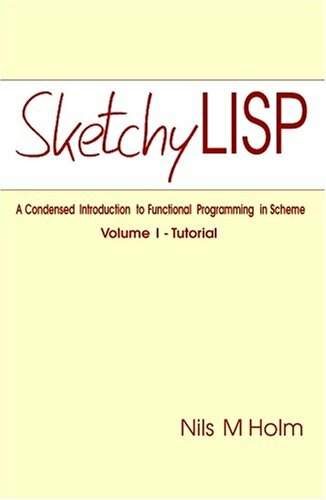 Sketchy LISP is a step-by-step introduction to functional programming in Scheme. It covers various aspects of the language including data types, conditional evaluation, list processing, lexical scoping, closures, recursion, dynamic typing, etc. By means of numerous examples of varying complexity, it takes the reader on an entertaining and informative tour through the language. This book provides an introduction to the Scheme programming language but not an introduction to programming in general. The reader is expected to have had some experience programming and to be familiar with terms commonly associated with computers. This is an introduction to the Scheme programming language. It is intended as a quick-start guide, something a novice can use to get a non-trivial working knowledge of the language, before moving on to more comprehensive and in-depth texts. This book presents an informal and friendly introduction to some of the core ideas in modern computer science, using the programming language Perl as its vehicle. The book takes the form of a series of working interpreters for the language PScheme. You'll start off with command-line arguments and parsing, and progress to writing a fully-functional Scheme interpreter that implements a good-sized subset of R5RS Scheme. Along the way, you'll learn Haskell's I/O, mutable state and dynamic typing.